Enderby Twinning Association is twinned with Le Haillan, a small town on the outskirts of Bordeaux in South West France. The aim of the Association is to promote and foster international friendship and understanding between the people of Enderby and those of Le Haillan to stimulate and foster the mutual exchanges at all levels between the communities. In 2017 the Twinning is celebrating it's 30th anniversary and Le Haillan was established 150 years ago. If you have an interest in the activities of the Association contact Barbara Spence on 0116 2848514 or e-mail barbara.spence19@googlemail.com. The Twinning Association was set up to support the Parish Council's connection. Saturday March 9th 2019 7.00pm for 7.30pm start. Light Buffet provided but bring your own drinks. £5 per person, maximum teams of 8 or come along and join a team on the night. Contact Christine on 01455 282829 to reserve a ticket. 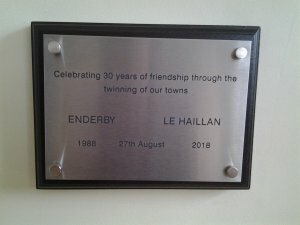 There was a short ceremony on Thursday 30th August at 12.15 am in the Small Hall at the Civic Centre to celebrate the twinning of Enderby with Le Haillan, in France. 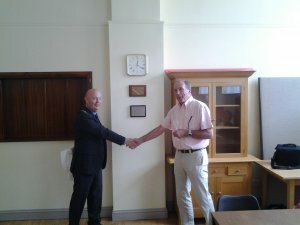 The Chairman of the Parish Council, Councillor Nigel Grundy unveiled a plaque which testifies that on 27th August 1988 the Twinning Charter was signed in Enderby Civic Centre by Brian Cooper, Chairman of Enderby Parish Council and Georges Ricard, Mayor of Le Haillan. In addition, a framed photograph of the Twinning Association and Jumelage members taken during the visit to Enderby in May 2017 was hung in the Small Hall along side other pictures, trophies and the two Charters. Present Chairman, Nigel Grundy, shaking hands with Brian Cooper who signed the original Twinning Charter 30 years ago.